My Very First Class in the Mail! I have been a crafter for very long time. And I have thoroughly loved attending classes through the years. However, I’ve noticed the last couple of years, actually fitting into my schedule a craft or stamp class has become near impossible. I was under the mistaken impression that as the kids got older, that I’d have a little more “me” time. Hah! Any parent that has kids in middle school or high school quickly figures out that their social life actually entails driving around their kids for their social life. Here’s the new normal: “Mom, I need you to drive me here/pick me up there/take me to the store to get something for a project due tomorrow. And don’t forget I have soccer practice every night this week but I don’t know what time I’ll be done so I’ll just text you when you need to come get me.” (Gotta admit, I’m kind of looking forward to my oldest getting his driver license next February.) Does any of this sound familiar? Since getting to an actual class setting became such a challenge for me, I wondered if I’m the only one going through this. I checked with a bunch of moms that I know and they all agree that their time is spent shuttling kids to and fro, or working, or taking care of the family. These are the people that really need some a couple hours away from the everyday but finding a single time that’s convenient to most of my customers is a challenge too. I started thinking that maybe I needed to offer a class in the mail that you can complete in the comfort of your home on your own time schedule. I actually attended one earlier this year and loved it because I could start the class at 9:00 at night, in my pjs, and work as long as I wanted to then finish it later. 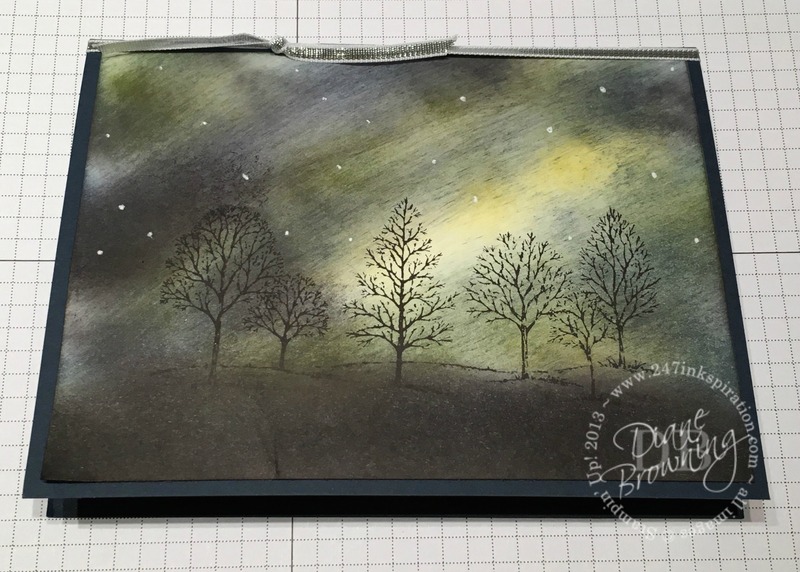 I am so excited to be offering my very first Class in the Mail: Northern Lights! Here’s how my first Class is structured. Email me that you’d like to purchase the class and I will send you a Paypal invoice. Once that is paid, I will order your products. 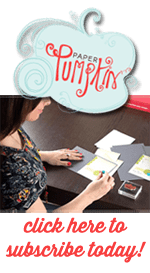 After I receive your order from Stampin Up, I will send you your supplies, card kit, and class instructions all together in one package. The cost for the Class is $40 for cling mount stamps or $50 for wood mount stamps. Please specify which you prefer when you request the invoice for the class. Already have the stamp set and supplies? You can purchase just the Tutorial for $12, which will be emailed to you. Here is what your finished card will look like. All the cardstock you will need to make six of these cards. Four sponge wedges – one for each of the four colors you will be using. Printed Tutorial with step-by-step instructions, which also include an additional three samples for different ideas using these same products. Stamp pads. For this Class I used Stampin Up’s Delightful Daffodil, Old Olive, Night of Navy, Basic Black. If you don’t have these colors, you can use any yellow, green, navy blue, and black pad you already own. 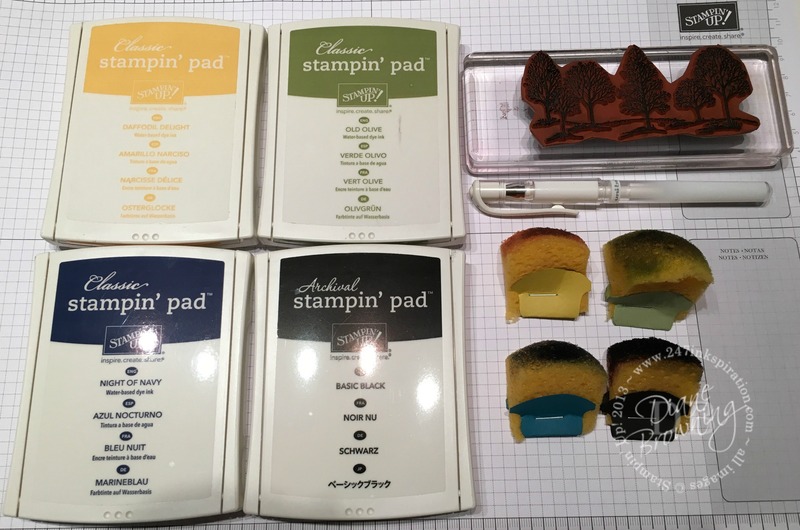 If you want to add the four Stampin Up pads to your class kit, you can do so for an additional $30, when you order them at the same time as your Class. Signo Gel Pen. If you want to add the Gel Pen to your class kit, you can do so for an additional $4.50, when you order it at the same time as your Class. Since this is my first attempt at a Class in the Mail, I would love feed back from you! I really want you to enjoy your Class and be happy with the results.